Subjects, styles, advertising, other relevant information: John Dillin Trengrove was the son of a ships carpenter, William H Trengrove b: 1821, Cornwall. 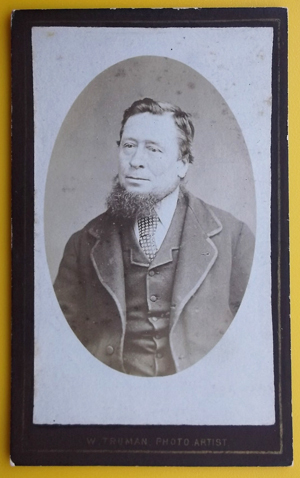 John was a photographer in 1871 living with his parents at 2 Prospect Place, Budock, Cornwall. By 1881 John had married and he and his family were living at 7 Scotgate, Stamford, Lincolnshire. John was a photographer. His family comprised: wife Rebecca b: 1852 Falmouth Cornwall and sons and William b:1874 Hitchen, Herts, and Arthur b:1880 Hadley, Herts. John Dillin Trenlove is recorded in the 1891 census as a resident of Crowland near Peterborough where his occupation was shown as a grocer and photographer and he was an employer of others. His wife, Rebecca b:1853 Falmouth was shown as a grocer and living with them was a grocer's assistant, Eliza M Brown b:1867 Market Harborough. Also present was John and Rebecca's son Arthur D Trenlove b:1881 Hadley, Hertfordshire. There is one local trade directory entry below, listing John as a photographer in Whittlesey in 1896. By 1901 John and his family had moved to 12 Foundry Lane, Spalding, Lincolnshire, where his occupation was shown as musical instrument dealer. In 1911 John had the same occupation but had changed his address in Spalding to 12 Vine Street. John is difficult to trace through the census returns - his name being variously recorded and transcribed as "Fengrove" and "Trengove". 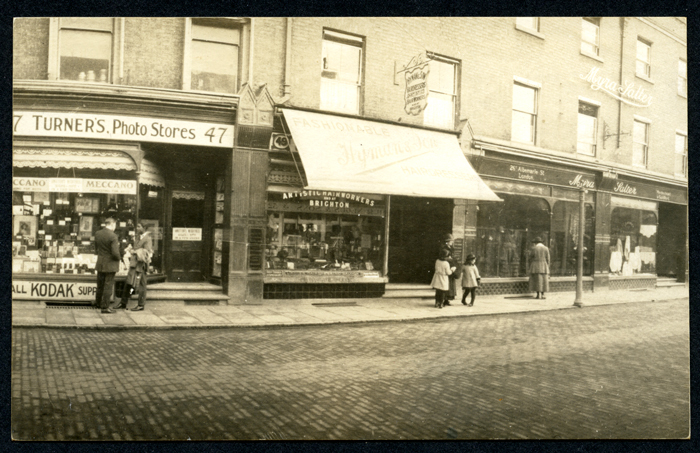 Subjects, styles, advertising, other relevant information: Wilfred was listed in the 1939 Register as a photographer's assistant at the above address with his wife Phyllis M Trevers b: 26/8/1912. Subjects, styles, advertising, other relevant information: See below carte de visite (Simon Shirley Collection) of unknown male, mounted on black square cornered mount, gold line round face, ornate gold lettering on reverse. 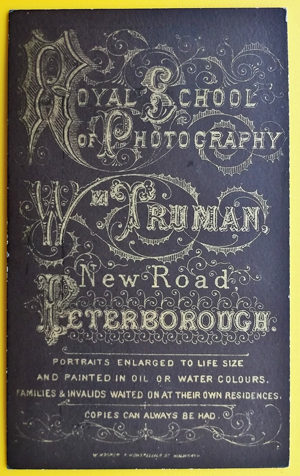 On the face "W Truman Photo Artist", on the reverse "Royal School of Photography W Truman New Road Peterborough. Portraits enlarged to life size and painted in oil or water colours, families and invalids waited on at their own residencies, copies can always be had." The mount is by W Hooper Montpellier Street Walworth. C. early 1880s. 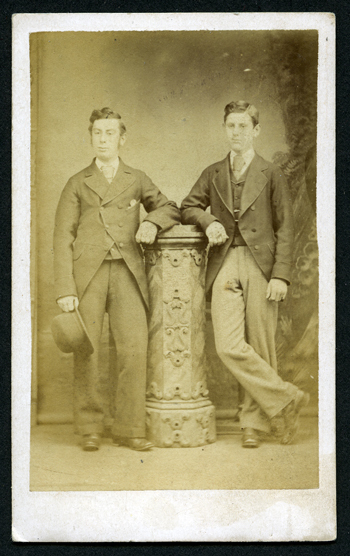 Below this is a second example carte de visite depicting two men standing leaning on an elaborate column. This is on an identical Hooper mount, except the mount is cream with red print and there is no text on the face of the mount. Manager: Harry Rands. Their studio was at 63 St Paul's Churchyard, City of London 3 floor from 1875 - 1878 when they were succeeded by London & County Portrait Co. This may be completely unconnected. References: No trace found yet in directories. Subjects, styles, advertising, other relevant information: The company name "Turner and Sons Cambridge Ltd" does not show up at Companies House. 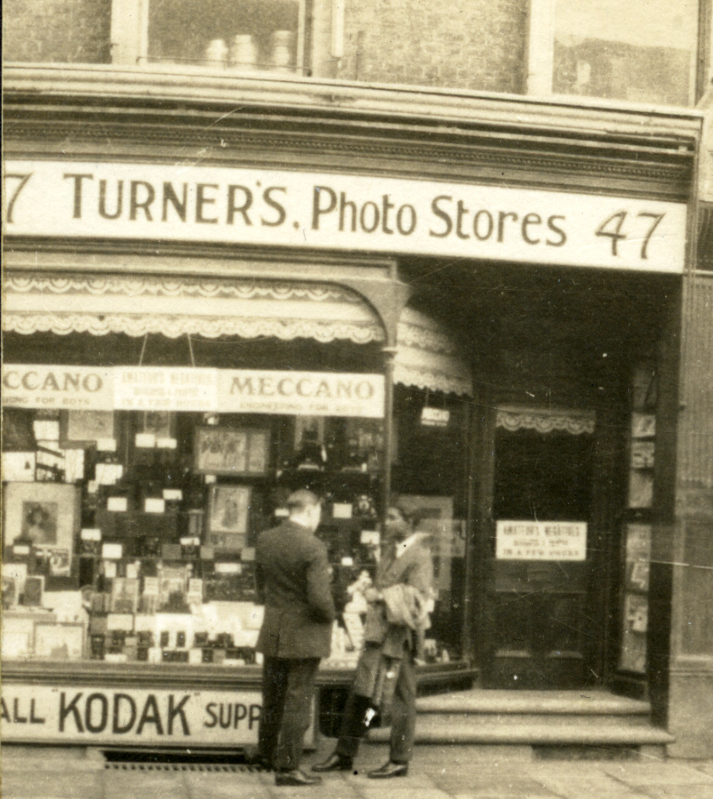 As an attempt to identify the individuals behind the firm, in the 1939 Register Ivan W Turner b: 1907 was listed as a photographic specialist and dealer, living at 30 Oxford Road, Cambridge. He was married to Doris E E Turner b:31/12/1913. 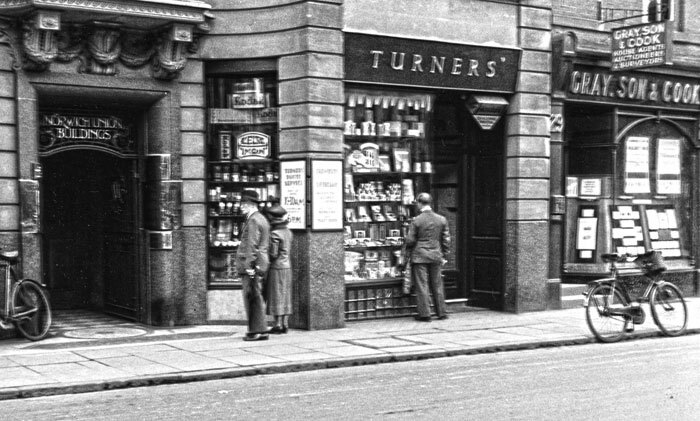 There was also a Frederick J Turner b: 31/3/1906 a photographer, photographic dealer and chemist's assistant, a single man, living at a lodging house at 28 Ferry Path Cambridge. In the 1911 census Ivan and Frederick Turner were shown as sons of Walter Frederick Turner b:1872 Norwich - who in 1911 was a chemist and optician, an employer, at 16 London Street, Basingstoke. Listed as Photographic Depot from 1930 and as a chemist, but in Kellys Directory of Cambridgeshire 1937 the firm was shown as photographers. 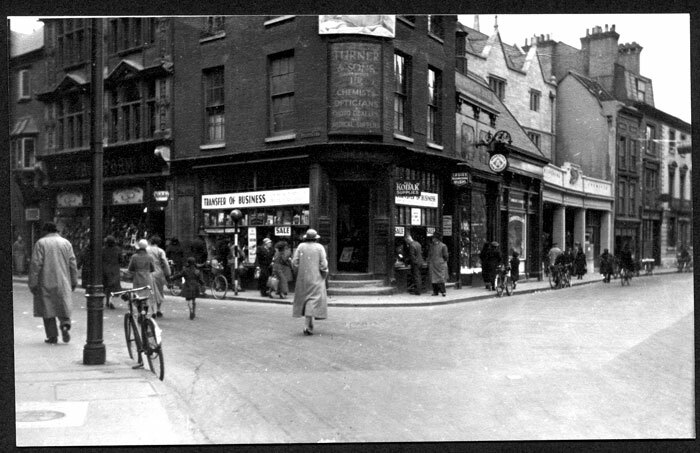 The postcard below, probably 1920s, photographer and publisher unknown, is a street scene of Regent Street Cambridge showing Turner's shop at No 47. 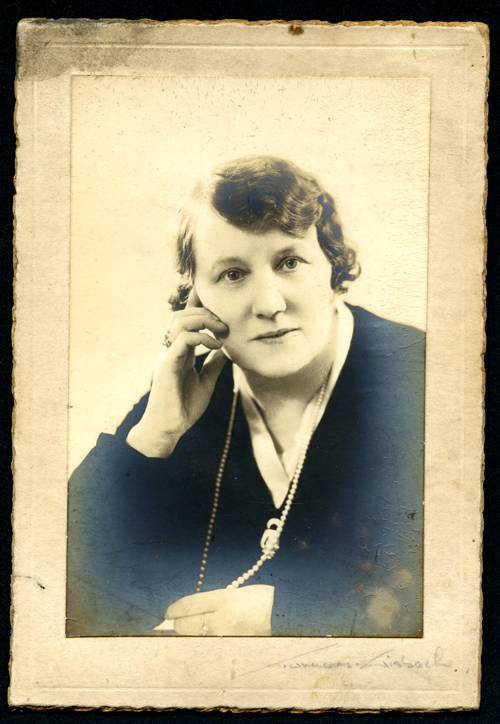 Below is a portrait of an unknown woman, possibly from the 1930s 5.25 x 3.5 inches on a heavy cream card mount 6.5 x 4.5 inches with a faux deckle edge - in pencil manuscript beneath is what appears to be "Turners of Wisbech" - enhanced beneath the image of the photo. Kellys Directory of Cambridgeshire 1933 -37. In Kellys 1933 the firm is shown as also operating at Wisbech in 1933. 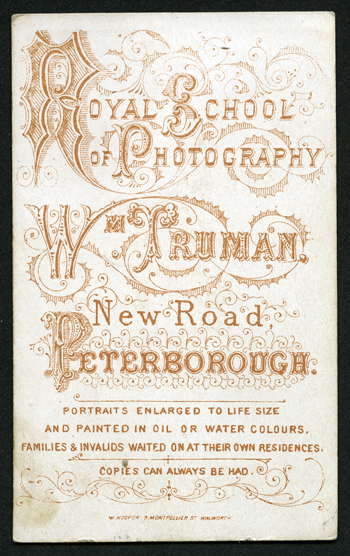 Subjects, styles, advertising, other relevant information: Only a single 1890 directory entry has been found so far for this Peterborough photographer. Subjects, styles, advertising, other relevant information: Leslie was the son of Arthur John Turnell, b:1880 Wellingborough Northants, a butcher and slaughterman of 84 Castle St Cambridge In the 1939 Register Leslie is shown as a professional photographer (commercial) at the above address. He was living there with his wife Ruby N Turner, b: 1906.